The Velvet Scoter remained off the pier throughout and on 28th the Stock Dove was seen in the Kirbest crop again. On 26th a Lesser black-backed Gull flew south through the Island while waders on the beach at Nouster included 156 Sanderlings, 44 Dunlins and 60 Ringed Plovers. 8 Redwings on 27th were the first for a few weeks and Skylark numbers continued to build with 76 present on the final day of the month. There was nothing to report on 24th, but on a sunny 25th two species were added to the 2013 year list. A Pied Wagtail on Nouster Beach was 3 days earlier than last years first and a European White-fronted Goose was with 3 Pink-footed Geese and the Greylag Geese near Bridesness. The Velvet Scoter remains in the bay at Nouster but the biggest surprise of the day was a Stock Dove at Kirbest-presumably the same bird seen at the end of January. 38 Skylarks included 24 presumed new arrivals in the observatory crop fields and a Chaffinch was new at Holland gardens. 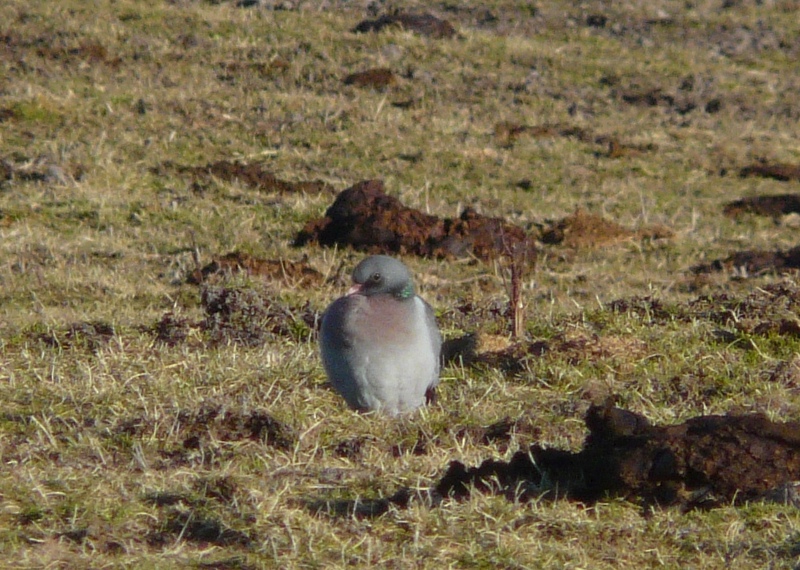 Stock Doves are less than annual on North Ronaldsay, with the bird present at the end of January the first winter record for the Isle. So it seems likely that today's is the same individual which has been keeping a low profile among the largely ignored, local Rock Doves for the past month. A few 'odds and sods' have trickled in with the cool south-easterly breeze over the last couple of days. The first Little Grebe returned to Bridesness Loch on 22nd when 7 Shelducks were on the Links. 6 Grey Herons together on Ancum and 4 Snow Buntings at the Observatory were the most notable arrivals on 23rd. And on the latter date the Velvet Scoter was back in Nouster Bay. Not much to report with office work dominating, mainly due to the cool wind! In rougher conditions the Velvet Scoter was back sheltering in Nouster Bay on both days, and 42 Skylarks were counted on 20th-36 of which were in the Kirbest crop field where the Kestrel was also seen again. Another sunny, windless day on 18th saw a few more Skylarks on the move, with 3 leaving north and out to sea and another 12 gathered in the observatory crops where 88 Twite were also present. 11 Pintails were at Westness, and the calm sea allowed 226 Eiders to be counted off the north end. It remained still, if a little drizzly on 19th and the result was a high count of 57 Long-tailed Ducks in Nouster and Linklet Bays. 13 Great Northern Divers were also counted and Black-headed Gulls have trickled in, building to 20. Waders on the beaches included the 2 Grey Plovers, 62 Ringed Plovers and 66 Dunlins, while a 'thrash' around the back of Hooking Loch found a single Jack Snipe flushed among 55 Snipe. A count of of all the wildfowl and waders on all suitable habitat as part of the 'WeBs' survey was undertaken today. Among the totals on the wildfowl front were 3 Whooper Swans, 961 Greylag Geese (plus the usual hybrid), 2 Shelducks, 167 Wigeons, 86 Teal, 69 Mallards, 2 Pintails, 2 Shovelers, 6 Tufted Ducks and 6 Goldeneyes. Notable wader numbers recorded were 110 Oystercatchers, 146 Lapwings, 80 Purple Sandpipers and 49 Bar-tailed Godwits. On a glorious sunny day there were a few signs of spring with 15 Skylarks seen, including 8 which came in off the sea at the observatory and headed north. A Snow Bunting flew out south to sea there, while a Water Rail caught in one of the Heligoland Traps was presumably the assumed over-wintering bird seen a couple of times before new year. After going missing for a day, the female Velvet Scoter was back in Nouster bay on 16th. In its place on 15th were the years first Little Auk and 16 Long-tailed Ducks. Also seen that day were the fourth Hen Harrier or the year so far (this time a sub-adult male), 2 Merlins and the wintering flock of Black-tailed Godwits at Bridesness had increased to a new high of 13 birds. A count of 49 Dunlins was notable for the time of year, and 135 Lapwings were also recorded. Also in the fields around the middle of the Island were 37 Fieldfares but just 2 Redwings, while the Song Thrush remains in Holland House gardens. A female Velvet Scoter in Nouster Bay on 14th was an unexpected bonus, and only the third record for the Island in the last decade (also the first in winter). With the sun out Skylarks were heard singing for the first time, while the Kestrel re-appeared near Holland. The 9 Black-tailed Godwits remained throughout as did a Pink-footed Goose, and a Jack Snipe was among the birds 'dazzled' for ringing overnight on 13th. Not much to get excited about in recent days. When its not been wet and windy outside its been cold or snowing! 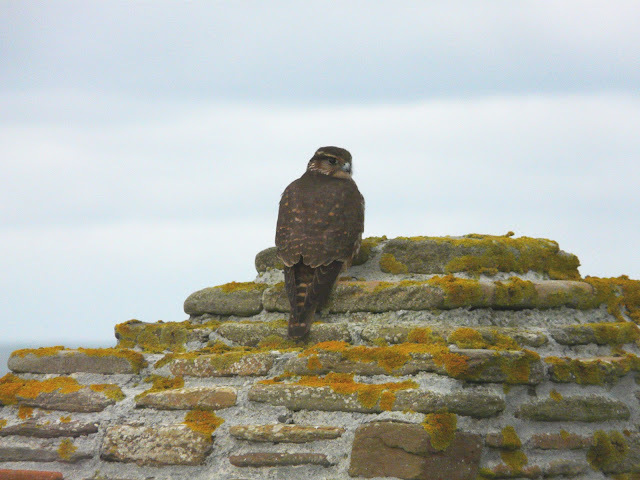 A juvenile Peregrine on 8th was the first for nearly a month, but would have been better if it had been the big white Falcon currently residing on mainland Orkney! On 9th a count of 48 Bar-tailed Godwits from the north end was good, while 9 of the Black-tailed Godwits lingered on Gretchen and 2 Grey Plover were on the Links on 11th. Twite have been ever present throughout the month in the Observatory crop fields and 50 have been caught and ringed so far at a baited site. Occasional Linnets have also been with them, but the 34 on 11th could have been early migrants as a result of a strong south-easterly wind? Both the weather and the sea continued to batter the Island on 6th but relented over-night to leave a glorious, if cool winters day on 7th. The juvenile Glaucous Gull was still at the north end on 6th, while a walk through the Kirbest crop fields found most of the Islands passerines there with 13 Skylarks, 55 Twite, 16 Linnets and 6 Reed Buntings present. The most notable arrival of the period was a Tundra Bean Goose near the Observatory on 7th and 3 different Hen Harriers were seen including an adult male. 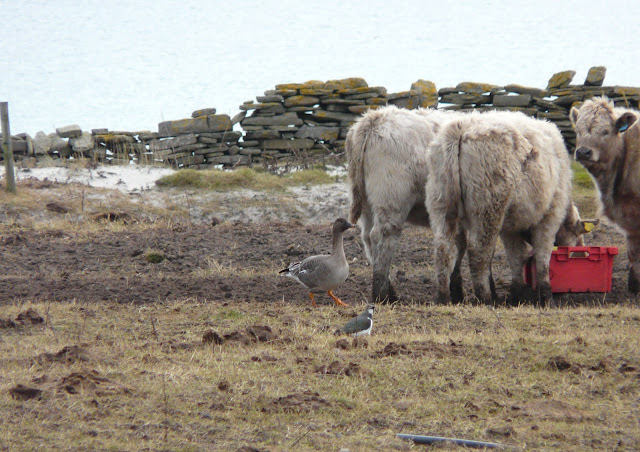 Unfortunately the camera focused on the cows backside, but you can just about make out the Tundra Bean Goose! After an afternoon of dramatic storms on 4th which saw even more of the sheep dyke 'taken down' by some impressive waves, the 5th was a much calmer day by comparison. The latter date allowed some birding to be done in the morning and saw masses of Gulls feeding in the swell off the north west coast and among the commoner species was a single juvenile Iceland Gull and the juvenile Glaucous Gull from last week. At the southern end an impressive 32 Red-throated Divers took advantage of the only sheltered bay around the Island, while the Black-tailed Godwits had moved to the now 'brackish' Gretchen Loch and numbered 12. A few Geese have possibly arrived as there are now 3 Pink-footed Geese present and one of the Greylag x Canada Geese hybrids from last year seems to have returned. 10 Pintail were also new into Garso, and on 4th a female Chaffinch had joined the wintering Song Thrush at Holland House. 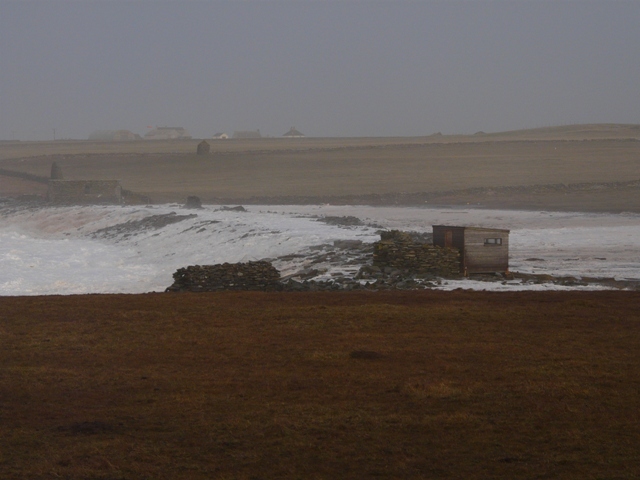 The sheep dyke crumbling as the waves hit the west coast and the sea flows freely into Gretchen Loch. 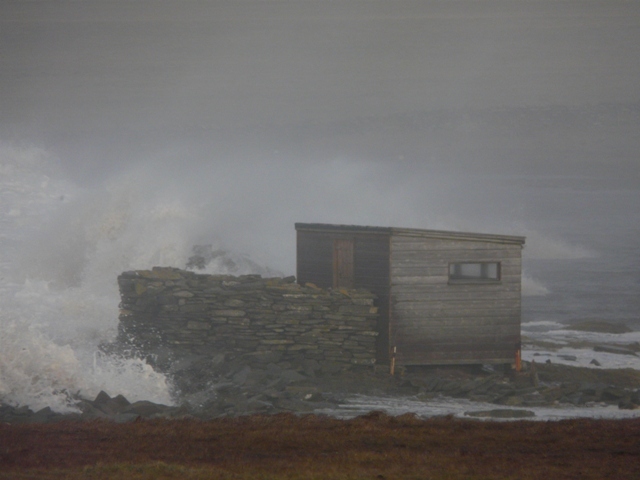 ﻿Miraculously the birdwatching hide survived the onslaught, but very little of the sheep dyke did! A return to wet and windy, blustery conditions has seen little change in the birds recorded over the last few days. On 2nd 10 of the Black-tailed Godwits were still to be found at Bridesness and there were 13 Shovelers with the commoner Wildfowl species on Hooking Loch. 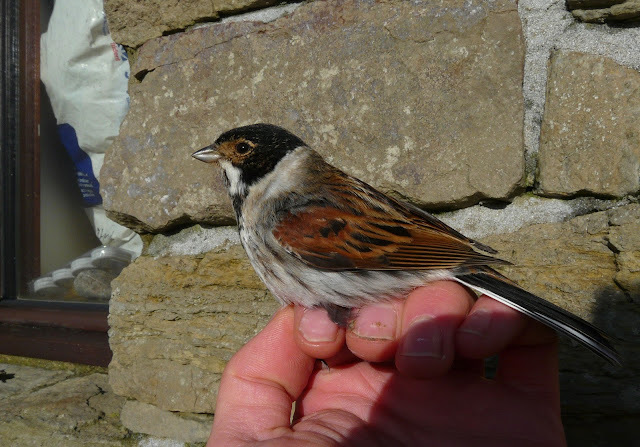 A few Thrushes remained and the Twite flock at the Observatory had reduced to 70 birds.